More good news for Scotland researchers. Ancestry.com has just published indexes to the 1851 and 1861 censuses. These records may contain information about the following: names, ages, occupations, relationships to head of the household, parish and county of birth (except foreign births, which give country only). These databases, and the linked images, are also available for a fee at ScotlandsPeople, the official government source of genealogical data for Scotland. For more information, or to search, click here. 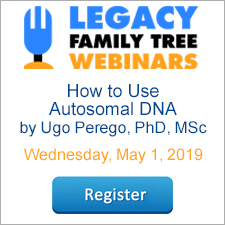 Users of Legacy Family Tree Deluxe benefit from expert research guidance. Just click on the Research Guidance tab, select your goal, and Legacy will suggest sources to help you extend your pedigree. Guidance is available for Scottish researchers as well. In a future update, these two new census indexes will be included in the list of suggestions so you can automatically be linked to the indexes. In the Family View, navigate to yourself, or the person to whom you want to calculate all the relationships. Click on the Tools menu, then click Set Relationships. Click on the Reports button in the main toolbar. Then click on the Books/Other tab, and click on the Relationships button. From here, choose your options, and Preview or Print the report. Like Ian mentioned, this report only lists the name of the person, and the relationship of that person to the starting person. At the present, this report does not have the option to include the lifespans. Click on the Name List button in the main toolbar. The Row 1 tab displays the fields that will print on the report. The Optional Fields at the bottom are customizable. Just click on the Customize button and select the Relationships field. Also select the Birth Date and Death Date fields. You should end up with something similar to the following picture (click on it for a bigger picture). Finally, on the Options tab, change the title to something like "Relationships to your name." Now Print or Preview, and you have the customized relationship report. If your genealogy information is in another genealogy computer program, Legacy's Import feature makes it easy to transfer the information into Legacy Family Tree - you do not have to retype anything. Export the information from your old genealogy computer program into a GEDCOM file. Import the GEDCOM file into Legacy. Step-by-step instructions for exporting your data. Click here for simple step-by-step instructions for exporting your data from a number of genealogy computer programs. Once completed, you will have created a GEDCOM file, which can then be imported into Legacy. Video - importing into Legacy. Once you have created the GEDCOM file, the next step is to import it into Legacy. The Legacy for Beginners training video demonstrates how to import the GEDCOM. After clicking on the following link, click on the GEDCOM section. Click here for the video. Did you know that the easiest way to import a GEDCOM file is to simply drag and drop it onto the Legacy icon which is on your desktop? When Legacy is closed, this will automatically launch the program and start the import process. This also works with PAF and Legacy files. Have you ever wondered what your ancestor's name meant, or where it came from? Maybe you are curious to learn about your own given name. Mike Campbell has spent thousands of hours compiling information about more than 14,000 given names from almost 100 different cultures. His work is now available online for everyone to use. The site is easy to use. I typed in the given name of one of my immigrant ancestors - Hans. Very quickly it explained that Hans is the German, Dutch, and Scandinavian short form of Johannes. My Hans did come from Denmark, and I was reminded to search for him using other forms of his name. Behind the Name will also translate given names into other languages. It listed five translations for Hans, and again, gave me other ideas by which to search. The site also contains namesakes, a glossary, name days, and message boards. Mike's list of sources is impressive and quite comprehensive. This site is one worth adding to your bookmarks. Search for your names here. Do you have a "brick-wall" ancestor? Are you writing a history of an ancestral family? Do you want to know what was happening when your ancestor was alive? If you answered yes to any of these questions, Legacy Family Tree can help. For years our family was stuck on Asa C. Brown's family. We knew that he moved from Connecticut to Pennsylvania, and eventually to Minnesota. It wasn't until we used Legacy's Chronology View that things started coming together. Legacy comes with a variety of historical timelines that can be automatically inserted/combined with an ancestor's timeline. We chose to include the Military timeline for Asa. This changed everything! It showed that in 1812 the War of 1812 had begun. Asa's age was listed as 20 - a perfect age to have served. Just knowing this convinced us to begin looking for military records. We found a pension packet, which included actual letters that he wrote. He explained that the "C" in his middle name stood for Clark (his mother's maiden name) and that in 1848 his home was destroyed by fire. Now we knew why his family moved that year. Looking at the historical timelines for his children, we saw that they were all of age to have served in the Civil War in America. These historical timelines bring life to our ancestors, but they can also help us write our own histories. One of the timelines included with Legacy shows all the major Inventions from the year 1023 to 1999. For instance, in 1868, J.P. Knight invented the traffic light. In 1929, Paul Galvin invented the car radio. Did you know that mobile phones were invented in 1947? If you are stuck trying to come up with good ideas for your own history, simply select the Inventions timeline while viewing your information in Legacy's Chronology View. Legacy will display all the inventions that happened during your life. You might be surprised at how much has happened since your birth. 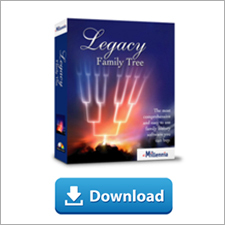 If you do not yet have Legacy Family Tree, you can download the free, standard edition at http://www.LegacyFamilyTree.com. However, the Chronology View is only available in the Deluxe edition. Using Legacy's timeline feature is presented as a free video tip. Just click on the link below, and then click on the Timelines section. Click here for the video. Making a multimedia backup and restoring it is the best way of moving multimedia files (pictures, sound and video files) attached to items in your family file from one computer to a second PC or laptop. Just backup your multimedia files on the first PC and restore them on the second. In addition, if you send a Legacy family file or a GEDCOM file made for Legacy to another person, you will also need to send the pictures as a separate file and a multimedia backup is the recommended way to do this. A regular family file backup does not include multimedia because Legacy does not embed multimedia files in the family file; rather it only links to where the original file is stored. These multimedia files must be backed up separately by clicking File on the menu bar and selecting Backup Multimedia Files from the file menu. You can backup to a writable CD, a jump drive or memory stick. Alternately, when exiting Legacy, be sure to first backup your family file and then as a second step backup your multimedia files. In addition, make sure that the multimedia backup file has a different name than your family file backup. If you use the same name the multimedia backup will overwrite your family file backup. The Legacy program does not (yet) have a utility that will restore (unzip) a multimedia backup. As a result, multimedia backup file cannot be restored in Legacy the same way that a backed family file can. However, if you have Windows XP or Vista, you only need to insert your backup disk or memory stick into the new or second pc and use the Extraction Wizard that comes with Windows or Vista. Just browse to the backed up multimedia file and click on it with the RIGHT mouse button and then select Extract All from the popup menu. The Extraction Wizard will open. Click on the Next button in the Extraction Wizard window. In the next screen type C:\ as the directory where the pictures will be extracted and then click the Next button. When restoring your multimedia files, extract them only to C:\ , where C is the letter of the drive where your multimedia files are kept. This ensures that picture and sound and paths will be preserved so that Legacy can find your files. If you extract to another location, Legacy won't be able to find the files because the extraction location is relative to the folder you select as the starting location. If you don’t have Windows XP or Vista, then you will need a program like WinZip to restore your backed up multimedia files. Please visit http://www.WinZip.com to download a free copy of this program. Please note: The multimedia backup file will only contain those pictures, sound and video clips attached to items within your Legacy family file. If you have additional images, etc. that are not attached, these will not be included, even though they may be located within the Pictures, Sounds and Videos subfolders within the Legacy folder on your hard drive. In addition, if you have more than one family file with attached multimedia files, these will have to be backed up separately. Most people don’t add pictures, etc. as often as they add new people and data. You need to backup your multimedia files only when you have attached new images, etc. to your family file. Be sure to get Legacy Family Tree Video Training Series - Volume 2, which contains the training CD: Picturing your Legacy: A Video Guide to Working with Digital Pictures in Legacy by visiting http://www.legacyfamilytree.com/Store/enter.html?target=../en-us/dept_3.html. Additional information on backing up and restoring files and working with pictures in Legacy can be found at http://www.legacyfamilytree.com/tipsBackups.asp and http://www.legacyfamilytree.com/tipsMedia-Menu.asp. If you've been thinking about joining us on our Legacy Cruise to Hawaii next year (2007), now might be the time to sign up. Hawaiian Air's outbound flights are cheaper right now than we have seen before. To get a quote, visit http://www.hawaiianair.com, and use October 1, 2007 as the outbound flight date (the day the cruise is over). For more information on our Legacy Cruise to Hawaii, please visit http://legacyfamilytree.com/CruiseInfo_2007.asp. Hope to see you there! Those of us with Irish research have learned that extending your pedigree in Ireland can be challenging. Thanks to Mike O'Laughlin, founder of the Irish Genealogical Foundation, Irish research just got a little easier. He recently published a series of podcasts about Irish research. Podcasts are like radio shows, but you listen to them online, and they are archived. Their first 'podcasts' were created on audio cassettes in 1984. With the opening of the Irish Roots Cafe they will have a great variety of topics and interviews. Listen to the podcasts at http://www.irishroots.com/podcast.php. NAPLES, Fla./Monday, October 30, 2006 — NewsBank, inc., one of the world's premier information providers, announced today the launch of GenealogyBank.com, a direct-to-consumer service, and America's GenealogyBank, a subscription service for libraries. Both provide researchers with unprecedented Web-based access to millions of the United States' core genealogical records from the 17th to the 21st centuries. "For the first time, GenealogyBank resources have consolidated tens of millions of valuable genealogy records from 1652 to the present in a single database," said NewsBank's Director of Genealogy Products, Thomas Jay Kemp. "The wealth of historical and genealogical content NewsBank has microfilmed and digitized over the past 60 years—much of which was prepared in cooperation with the American Antiquarian Society—is now fully searchable online, with new content being added every day." "[GenealogyBank's] constantly-expanding content is remarkably varied, immensely useful and delightfully out-of-the-ordinary," said Joy Rich, M.L.S., Editor of Dorot: The Journal of the Jewish Genealogical Society. "GenealogyBank clearly was created and structured with the needs of genealogists at all levels of research in mind." Researchers can gain unlimited access to GenealogyBank.com for $19.95 per month. For details on library subscriptions to America's GenealogyBank, contact your NewsBank representative. Visit www.newsbank.com/genealogists for more information on GenealogyBank.com or America's GenealogyBank. NewsBank has been one of the world’s premier information providers for more than 35 years. NewsBank serves publishers, public libraries, colleges and universities, schools, government and military libraries, genealogists, professionals and researchers worldwide. Through partnerships with leading publishers globally, NewsBank provides Web-based access to more than 2,000 newspaper titles, as well as newswires, broadcast transcripts, journals, periodicals and other publications. NewsBank also offers authoritative digital collections of historical documents, curriculum resources covering all subject areas and extensive media services for publishers. For more information, visit www.newsbank.com. *** For the Danish edition of this press release, please click here.